I really like this band. Hailing from Finland, Soulhealer debuts their first full length title, The Kings of Bullet Alley. It's a tour-de-force of melodic heavy metal, echoing the best of this classic genre. Above, Soulhealer: lighten up boys and smile, the album is quite good. From the gate you'll catch this feeling. Though not the best cut on the album, the opener Kings of Bullet Alley proves Soulhealer gets it. The song is a heavy rumbling number with melody and hooks. This combination of hook and melody invades most every song, whether by lyrics, vocal arrangement, or harmonious guitar structure, making them click with entertaining fury. Notable are Nightfall, My Last Day, and the properly vigorous Heading for Tomorrow. Perhaps a small drawback is that some songs felt unnecessarily long such as Wheels of Fire, Zoned Out, and Blind Faith. It seemed the band was simply grinding out some more to fill up time. But, conversely, Blind Faith has a boatload of nice guitar solos that makes the extra time bearable. 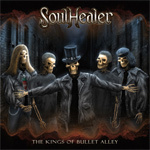 Overall, for the classic melodic heavy rock and metal style, I was rather impressed with Soulhealer and The Kings of Bullet Alley. Quite recommended. 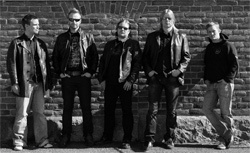 Well-grounded in the classic genre, on The Kings of Bullet Alley, Finland's Soulhealer offers a vigorous platter of melodic heavy rock and metal.